Screenplay: Natto Wada, from an original story by Michio Takeyama; photography: Minoru Yokoyama; editor: Masonori Truju; production design: Takashi Matsuyama; music: Akira Ifukube. Cast: Shoji Yasui ( Private Mizushima ); Rentaro Mikuni ( Captain Inouye ); Taniye Kita Bayashi ( Old woman ); Tatsuya Mihashi ( Defensive commander ); Yunosuke Ito ( Village head ). Awards: San Giorgio Prize, Venice Film Festival, 1956. Anderson, Joseph, and Donald Richie, The Japanese Film: Art and Industry , Rutland, Vermont, 1959. Svensson, Arne, Japan , New York, 1971. Soumi, Angelo, Kon Ichikawa , Florence, 1975. Bock, Audie, Japanese Film Directors , New York, 1978. Allyn, John, Kon Ichikawa: A Guide to References and Resources , Boston, 1985. Baker, Peter, in Films and Filming (London), April 1960. Richie, Donald, "The Several Sides of Kon Ichikawa," in Sight and Sound (London), Spring 1966. Milne, Tom, "The Skull Beneath the Skin," in Sight and Sound (London), Autumn 1966. Ichikawa, Kon, and others, "The Uniqueness of Kon Ichikawa," in Cinema (Beverly Hills), Fall 1970. Johnson, W., "Ichikawa and the Wanderers," in Film Comment (New York), September-October 1975. Variety (New York), 12 June 1985. Dipont, M., in Kino (Warsaw), June 1986. Dissanayake, Wimal, "Self, Agency, and Cultural Knowledge: Reflections on Three Japanese Films," in Wimal Dissanayake, editor, Narratives of Agency: Self-Making in China, India, and Japan , Minneapolis, 1996. Biruma no tategoto , directed by Kon Ichikawa, won the San Giorgio Prize at the 1956 Venice Film Festival. Although Ichikawa had been directing since 1945, this was the first film to bring him international recognition. The film, starring Shoji Yasui as Private Mizushima and Rentaro Mikuni as Captain Inouye, concerns the last days of World War II in Burma. Mizushima's unit is captured and they are made prisoners of war. He is reported missing, but actually he has been commissioned to convince a garrison of Japanese soldiers to surrender rather than incur further bloodshed. He is unsuccessful in his mission, and the garrison is attacked, Mizushima becoming the sole survivor. He is nursed back to health by a Buddhist priest whose robes he steals in an effort to return to his unit. Crossing the island he comes upon several abandoned corpses and feels compelled to bury them. For the Japanese, to die on foreign soil and remain unburied is the most ignoble of deaths. By the time he meets his former companions, he is committed to his new mission of burying the dead and refuses to be repatriated. In concept the film reflects the post-World War II pacifism prevalent in Japan as well as a spirit of international humanism. Both Japanese and British are portrayed as caring individuals caught up in an inhuman war. War and death are the enemies. Mizushima's decision to remain in Burma is an act of contrition, which emerges in part from a sense of Japanese postwar shame and guilt. 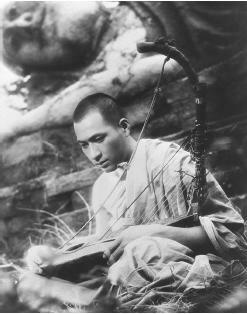 Throughout his wanderings, Mizushima carries a Burmese harp. This serves as a source of inspiration, a signal, and a means of communication which unites British and Japanese. The tune, "There's No Place Like Home," an American melody, is sung alternatively by both groups, signifying the peaceful commitment to home and family which Mizushima will be sacrificing by remaining in Burma. Ultimately the harp becomes Mizushima's voice. In addition to the interplay of light and shadow, evocative closeups, and point-of-view shots, Biruma no tategoto is noteworthy for its fragmented narrative structure. The story unfolds through a series of flashbacks and parallel action depicting Mizushima's plight in contrast to the experiences of his unit. Like Ichikawa's next film, Nobi , the film documents the human suffering, brutality, and carnage which are inevitable results of war. However, whereas Nobi ends on a pessimistic note with the death of the hero, Biruma no tategoto closes on an inspirational note, signalling the goodness of man and universal brotherhood. Ideologically the film speaks of the value of life and survival in opposition to the pre-World War II official position of allegiance to the Emperor and dishonor in surrender. The film plays upon the traditional conflict between giri and ninjo (desire and duty). Mizushima longs to rejoin his friends and to return to Japan. But he is equally pulled by a higher duty which calls for the burial of the dead. As in all Japanese narratives, ninjo wins out after an emotional struggle. Mizushima's choice is especially difficult because his voluntary isolation deprives him of group support and comradery, a crucial aspect of Japanese society. Ichikawa's emphasis upon the warmth of group solidarity makes Mizushima's loss all the more heartrending. Further, Ichikawa, in an exception to the ironic attitude which pervades the majority of his works, expresses an emotionalism, especially in the scenes where the men beg Mizushima to return with them and in Mizushima's silent determination to remain. The film ends as the ship taking the soldiers home pulls away from shore. It is a subjective shot from Mizushima's point of view. On board the men talk of the Ginza and movies. They have already turned to the future. Only Mizushima remains to remember the past. His solitary sadness reflects a traditional view of the acceptance of life's tragedies. Yet equally, Biruma no tategoto marks Japan's postwar conversion from one value system to another. The film's implicit critique of feudal values reflects Japan's decision to become a full member of the international democratic community.